Lowdown: The story of an eccentric owner whose dog saves a small penguin colony. 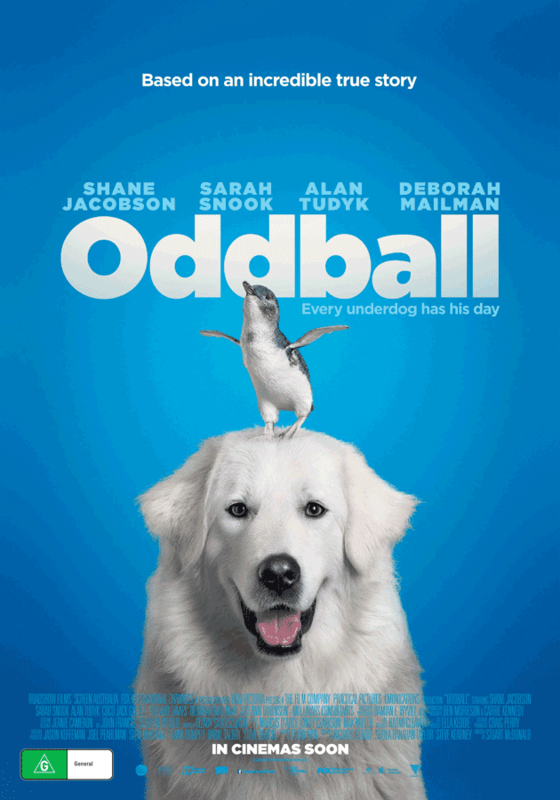 As far as cute little Australian feel good movies are concerned, the type that doesn't require its audience to dedicate much mental capacity, Oddball is pretty much as far as the genre goes. It starts with the Stars: Shane Jacobson, aka Kenny, as Swampy (yep, Swampy). Then there's Sarah Snook, the latest Aussie actress to show up everywhere (good on her! ), as his daughter Emily. And third is the family Labrador dog, Oddball. The foundations are set for a feel good story taking place at Warrnambool, a Victorian seaside regional centre type town lying a bit past the edge of The Great Ocean Road. As Australian regional centres go, it is a kind of a middle of nowhere place with an inferiority complex bundled with aspirations for greatness. Which is why it is seeking to increase its commercial tourism appeal while failing to defend the natural but not much of a money making beauty that is the penguin reservoir at its midst. No matter how much effort Emily, its keeper, makes. Enter Oddball. By fluke, Swampy the chicken farmer realises Oddball has a natural instinct for protecting penguins from evil [imported!] foxes. So he goes out, field testing Oddball on that penguin reservoir. From that point onwards the outcome is clear and the only question is just how much effort it would take for human commercial endeavours to succumb to natural beauty. Just don't take this movie too seriously. Even if it does claim to be based on true events. I mean, how true can it be when our dog owner keeps looking for his lost dog around the Twelve Apostles site? As magnificent as that area is, it is quite far for a dog to just pop over to by a whim. About 80 kilometres far (from Warrnambool). One gets the feeling true fact was abandoned on the altar of attracting tourists. Overall: If you're willing to switch the brain off and "endure" a kid friendly feel good movie, this oh-so-Aussie you can chuck it on the barbie movie will certainly deliver. 3 out of 5 crabs, mate!